Michael Jordan took a step away from the NBA, so the Air Jordan 9 (IX) Original Powder Blue was not worn by the man Jordan on the courts. But to this day, the Air Jordan 9 (IX) Power Blues are a collectors item. If not kept hidden away, the Air Jordan 9 (IX) Powder Blues will tend to yellow on the uppers, and start to crack through the Powder Blue midsole. 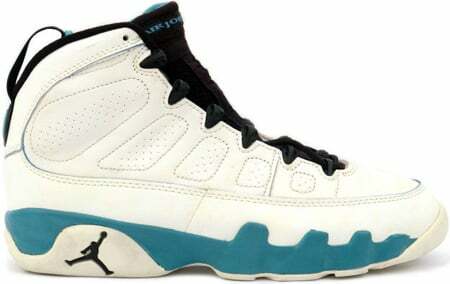 Price for the Air Jordan Original 9 (IX) Powder Blues will go for $350 – $450.